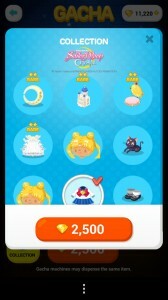 Sailor Moon Crystal content has been added to Line Play. 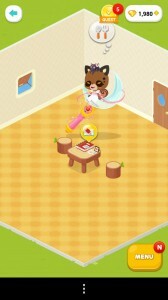 What’s Line Play? It’s an avatar based mobile game where you can dress up your character, buy furniture for your house and interact with other players all while doing menial tasks (or paying money…) to get gems to buy more items. 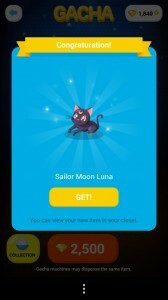 I’d never heard of this game when this news was announced on the Sailor Moon official site so I downloaded it to see what it was all about. 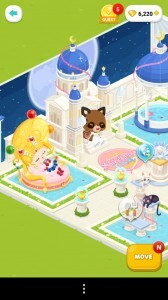 Line Play is a Japanese game but there is an english version. It is available in the iTunes store for iOS devices and the Google Play store for Android devices. I have heard people had issues getting the iOS version in English speaking countries but I had no issue installing it on my Android device. To say the game isn’t really for me would be somewhat of an understatement but it seems to appeal to some people. The Sailor Moon content is interesting enough. 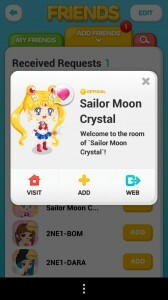 You can add Sailor Moon Crystal as a friend and after doing so you can travel to Sailor Moon Crystal’s room which is totally filled with cool Sailor Moon Crystal gear! 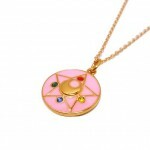 Sailor Moon themed furniture and decorations as well as costumes. Wouldn’t it be great if you could get some of these items for yourself? Indeed you can! 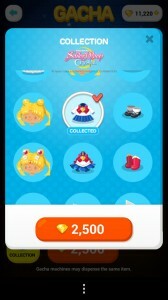 Using the “Gacha” in the Sailor Moon Crystal room you can use 2500 gems to get a random Sailor Moon item. 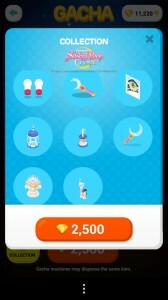 With the 10000 gems you start with you can get four such items. You gain gems at a slow rate while playing or, naturally, you can pay real money to buy some! I played all of my gems and got four items. First I got two copies of Usagi’s school uniform which is called “Serena School Uniform”. This is a curious choice of names given Serena is the name from the old English dub, not that used in the English adaptation of Sailor Moon Crystal or for the new dub of Sailor Moon which will soon be released by Viz. 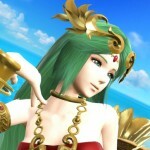 Still, many fans of the series from back in the day may be used to that name and so she is referred to as Serena. 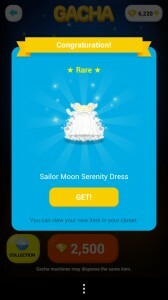 Next I got Serenity’s dress, which is a rare item. Both of these are clothing items which can be equipped through your closet. 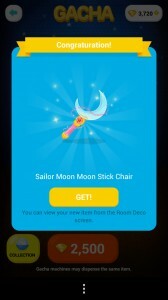 Next I got a Moon Stick Chair which is a furniture item you can place in your house. 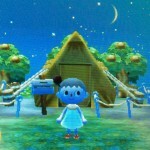 Finally I got Luna which is a fashion accessory which can be placed on your head. 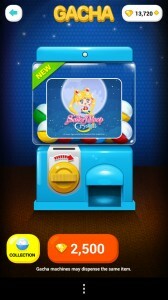 While playing Sailor Moon also took a number of baths. So scandalous! Keep reading to see more images from the game. 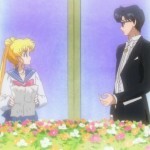 This entry was posted in Pretty Guardian Sailor Moon Crystal (2014), Video Games and tagged DiC/Cloverway English Dub, Gashapon, Line Play, Luna, Moon Stick, Princess Serenity, Sailor Moon, Video Games by Adam. Bookmark the permalink. I would really like to try this game out. Unfortunately, I can’t locate it on my Google Play store or iTunes store from my iPad or Android phone. Do the stores need to be updated in order to see the game? If so, how do you update the stores? 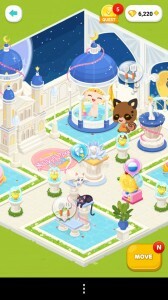 I just searched Line Play in the Google Play store and it showed up. Not sure what else to say. Hello there. Would you be able to post detailed instructions on how to locate the game? But you just said you played it in the us. Actually, it’s available to play here but it was for a limited time. I downloaded the game back in March when it was available to the U.S. The only way you can download the game now is by switching to a different country in iTunes.